The cutest little mini Bible on a key chain is sure to put a smile on your guest's faces! 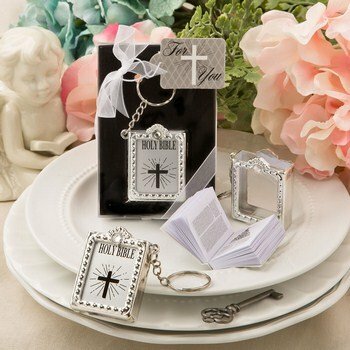 Allow your guests to keep the word of the Lord close by on a glorious key chain when you offer them these delightful favors at your event. Thank you! Ladies of my church will love them as mothers day presents! I have been in charge of getting mothers day gifts the last 2 years and I have got them through this company! Tho I will not be giving them out till May I love that they got here so quickly and I don't have that burden of not having them on time! Thank you!! I just know the pastor's wives will be delighted with the Holy Bible key chain miniature bible favors. They arrived promptly, even though they were on back order and are packaged perfectly for gift giving. 1st Problem - When I took the 1st keychain out, the link disconnected. 2nd Problem - The Bible keeps falling out. Haven't had a chance to use. Very pleased with what I see. Need magnifying glasses, but that's part of the uniqueness.